The Internet offers so many things to users including communication, shopping, research, downloads and more. Uploading and sharing of videos is also very common on the web. Flash videos are often created and shared to various video sharing sites like YouTube, Facebook, Vimeo and Hulu for different reasons. Some do this for hobby, while others do this for business or for their work. Most companies create flash video to serve as tutorial for their products or websites. Through this, it will be easier for users to learn about what they have to offer, thus, improving user experience. Flash videos can also be used for demonstration, training or presentations. There are various applications that you can use to make flash, whether for personal or business purposes. 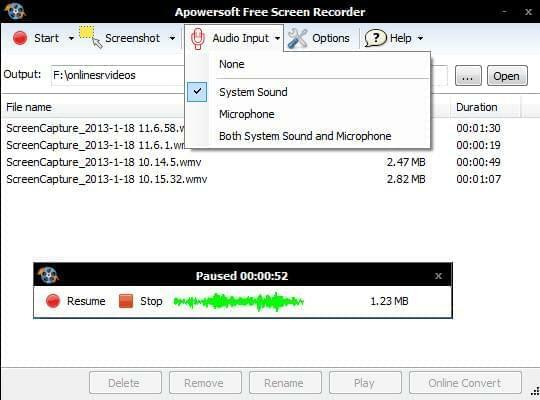 Apowersoft Screen Recorder and Apowersoft Video Editor are two of the best programs that you can try. This is a free application that you can use in making flash video for presentations, tutorials, demos or even for entertainment. It has a simple interface that is easy to understand and options that are straightforward. Whether you are a pro in creating a flash video or you are just starting on this field, you will find it convenient to use this program. It records any activity that you have on your screen, so you can easily show how specific steps are made on your computer in case you need this for your report or presentation. If you wish to include audio on your video, this is not a problem with this screen recorder as it can simultaneously record audio and video without delay. It also comes with an option to use your microphone to capture sounds to be added on your video. It automatically saves videos to WMV format but it comes with a built-in converter that you can use to convert them to FLV format if you are creating flash video. Best of all, this app does not have time limitation so you are free to record videos as long as you want. This is a great application if you wish to add fantastic effects on your flash videos. It comes with over 300 effects that will make your videos outstanding. Do not experience on how to create a flash video? There’s no need to worry about that because it was designed with every user in mind. Because of its user friendly interface, it wouldn’t take time and you will find yourself making flash animation like a pro with this great tool. Once you have the downloaded this flash video maker, you can start creating eye catching and professional videos that you can share or upload online. Launch the application and click the import button to add the videos, photos and sounds that you would like to include. Drag the files you wish to add on the timeline below the window. Drag videos on video area, pictures on the PIP area and audio on the music area. You can now start editing media by double clicking on the video, picture or music you wish to edit. This will put you to edit mode. Some of the edit options that you can use are trim, cut and crop. Click on the appropriate button to do so. You can also rotate photos in case they are inverted. Next to media are other edit options to make your video more presentable including text, effect, PIP, transition, intro/credit and sound. Click the Create button once done editing. Click Format and choose FLV to create a smaller size video.